What do you do when you have two overripe avocados, tomatoes, cilantro, lime, no chips, and no motivation to put on suitable clothes for the supermarket? 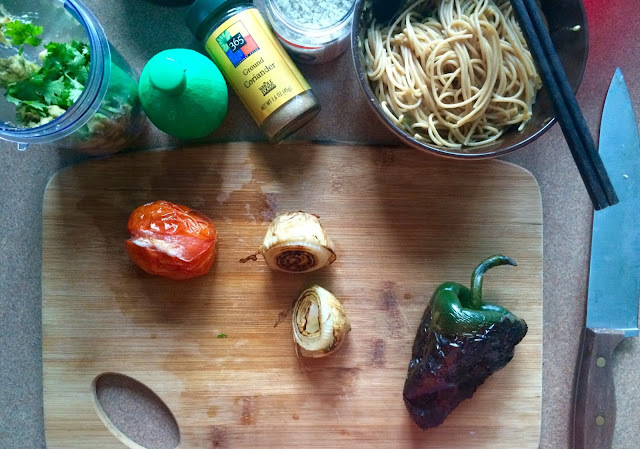 Roasted poblano and avocado spaghetti of course. Making a mess is unavoidable. This was also the weekend I forwent doing anything to sleep for 48 hours. Whole wheat noodles are... not good. What was I thinking? Trying to become an expert in foams, but my attention span won't have it. So cleared my head with boat parking-grapefruit liqueur-wow milk in reverse order. I didn't think you could be good or bad at picnicking until Concert on the Square.